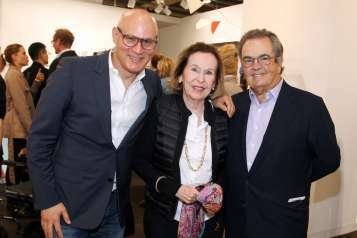 Anyone who knows Aerin Lauder realizes that the businesswoman and Estee Lauder heiress is an authority on good taste. 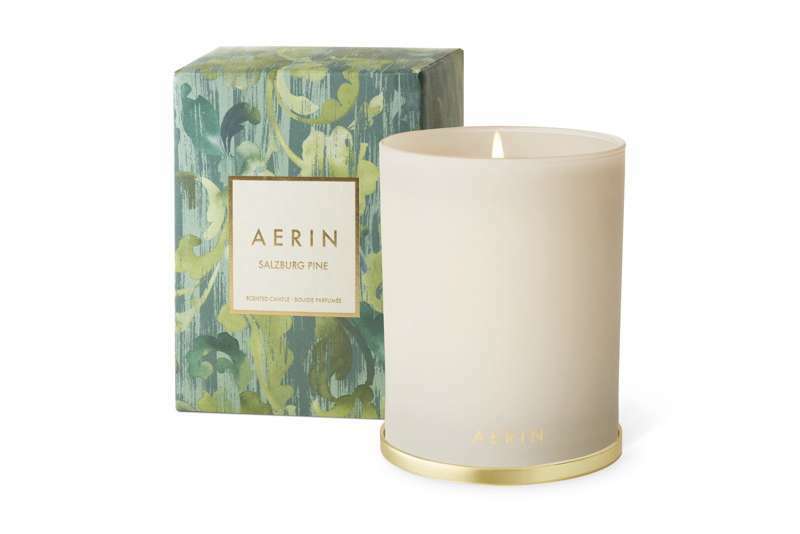 After all, her comprehensive global luxury lifestyle brand, AERIN, includes high-end offerings across the realms of home goods, accessories and, of course, beauty. Now, AERIN’s founder and creative director has launched her first-ever collection of wall coverings, as developed in collaboration with luxe textile company Lee Jofa. 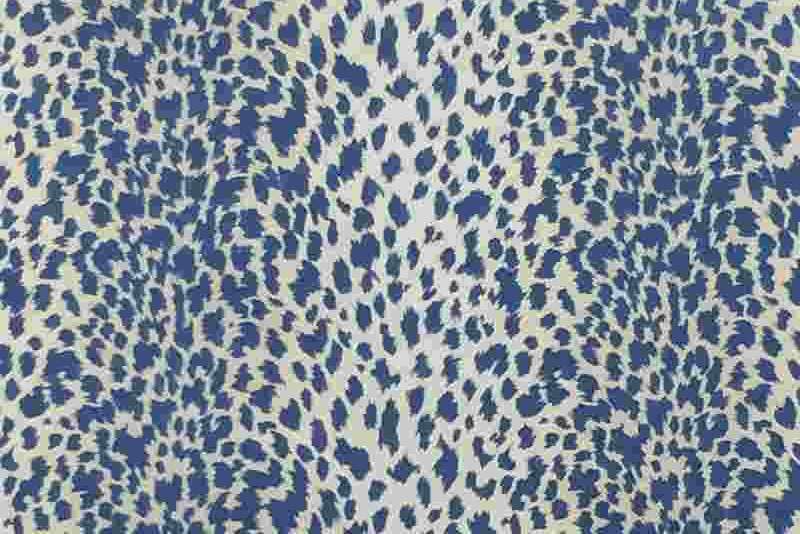 The coverings are available in two designs: a three-paneled scenic mural and a leopard print, blending Lauder’s love for vintage patterns with a classic, feminine touch. The collection was developed with an emphasis on nature, combining rich, organic patterns and intricate details for an elevated aesthetic. Vibrant metallics mixed with neutral prints and a range of brightly colored reds, blues and greens give the feeling of depth while the darker navy, brown and black round out the collection for a feeling of added warmth. Along with the debut of AERIN’s second fabric collection with Lee Jofa, the scenic wallpaper mural Beaujeu is offered in a coordinating two-panel linen print. “In developing this collection, I wanted to create effortless yet modern patterns that could really change a space to be more inviting and beautiful,” says Lauder, who adds. “I’ve always liked to incorporate pattern and texture in my own interiors. I believe that your walls are just as much of a statement as your furniture and decor.” On that note, this style maven offers her tips on how to decorate your home in the hautest way possible. Start with Lighting – When designing a room, I always start with the lighting. Light fixtures can truly transform a space and are an easy way to update from season to season. When we design the AERIN lighting collections, we like to introduce new product will also building off of existing fixtures so our customers can build families. This Fall, we’re expanding on the Dover and Sanger collections. Consistency is Key – Much of my decorating lessons came my grandmother and my mother, both loved to decorate and I inherited much of my passion and design aesthetic from them. My mother’s decorating style has always been very put-together. She taught me the importance of consistency in a home and I inherited her love of classic, timeless pieces. I translated that classic look into the AERIN brand in a less formal way to create a more effortless, lived-in look. Small Changes Matter – I love changing decorative pillows from season to season – it’s an easy update and makes a room feel very different. When it comes to pillows the only rule I have is to keep them fluffed. Blend Old with New – Mixing vintage and modern pieces is one of my favorite decorating tips and it rings true in each of my homes. In my New York Apartment, you will find a lot of timeless family heirlooms mixed with modern pieces. When I travel, I spend a lot of time in local markets and have collected so many beautiful vintage pieces. Consider All of the Elements – Adding scent to a room is another easy touch that makes a big impact on both the feeling and décor. I love using fresh flowers or candles, I love using candles from our new line of travel inspired candles. They bring back memories of some of my most treasured family vacations. Mix and Match – I love mixing combinations of fabrics, furniture, antiques, and lighting. For example, rock crystal and tortoise shell or unexpectedly pairing crushed velvet pillows with a masculine sofa covered in wool. The new AERIN line of wallpaper was designed with this in mind. We have a scenic three-panel mural and a leopard print that are beautiful on their own but also mix well with other patterns and textures. Layer and Stack – I love to layer and stack objects. Even in small spaces, you can still have a very functional and beautiful space by stacking beautiful books on cocktail tables or layering framed pieces of art. 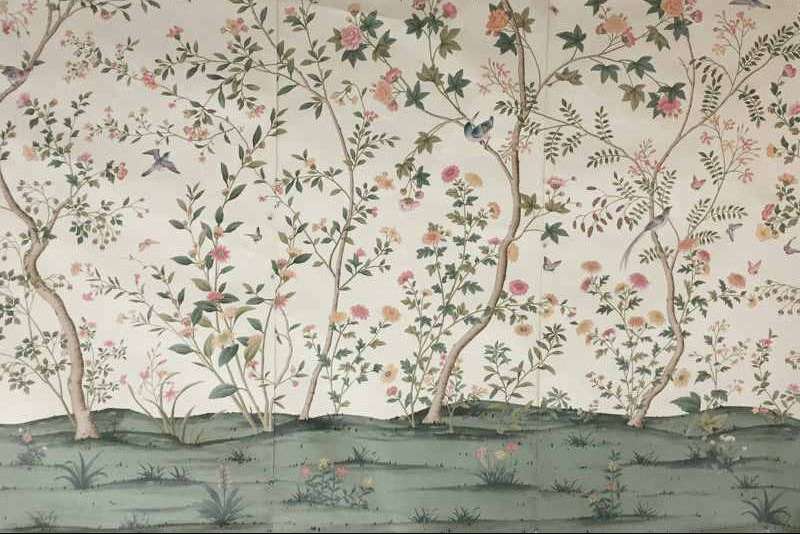 BEAUJEU: Inspired by hand painted Chinese scenic panels from the 18th and 19th centuries, the Beaujeu pattern features intricate trees and plants in full bloom, with beautifully precise renderings of birds and insects. This enchanting wallcovering is offered in four colorways with Grey, Metallic and Multi on paper and Petal/Jade on grasscloth.